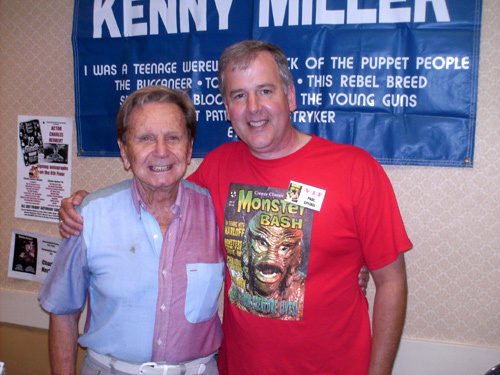 The Monster Bash 2010 featured Guests of Honor Billy Gray, Jimmy Hunt, Ann Robinson, George "The Animal" Steele, UFO expert Stan Gordon, Kenny Miller, Julie Adams, Bert I. Gordon, Charles Herbert, Susan Gordon, Bill Hinzman, Kyra Schon, Wes Shank with "The Blob," Tom Savini, John Russo, George Kosana, Cortlandt Hull, Richard Gordon, Chilly Billy Cardille, David "The Rock Nelson," Son of Ghoul, Penny Dreadful and many others! Photos provided by Barb Heiss, Jerry Armellino, Kevin Slick, Charles Henson, Pat Gonzalez, Phil Smoot, Jeff Stoll, Steve & Maxine Wrzesien, Brian Keegan, John Santiago, Michael Joyner, Paul Speidel, Anna Marie Henson, and others - thank you! 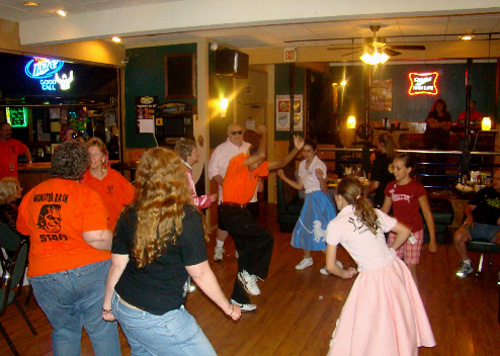 The sock hop beins in the hotel restaurant! This is part of a GREAT slidshow put together by Ken Blose and includes many of the Guests of Honor too. CLICK HERE to see the slideshow or on the picture above! 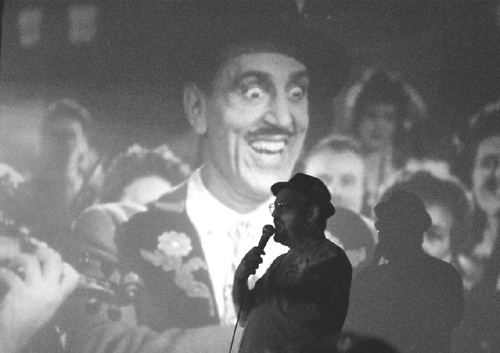 Bob Pellegrino sings the "Festival of the Nw Wine" song in one crazed Saturday Night at Monster Bash 2010. 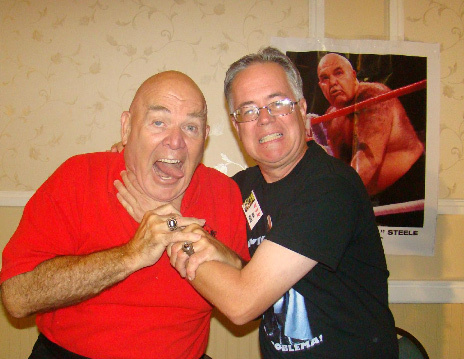 George "The Animal" Steele gets the choke-hold from Ken Blose! This is part of another great slidshow from Ken. CLICK HERE to see the slideshow (or on the photo above). You never know who will be at Bash. 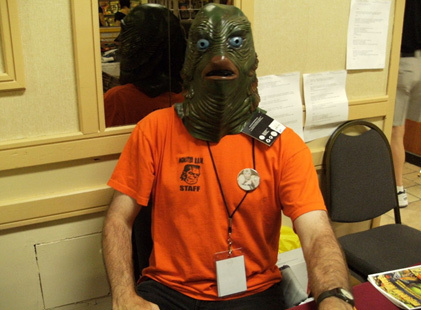 Is it my imagination, or is the entire Monster Bash staff starting to look like the Gill Man! 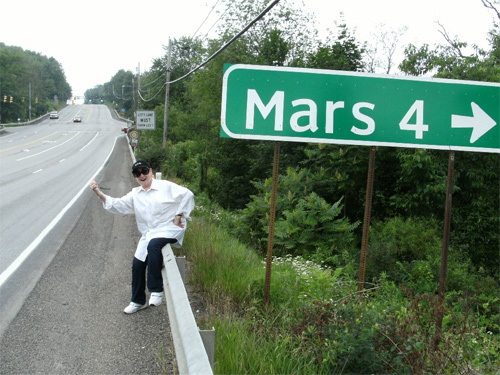 Who is that hitchhiking to Mars? 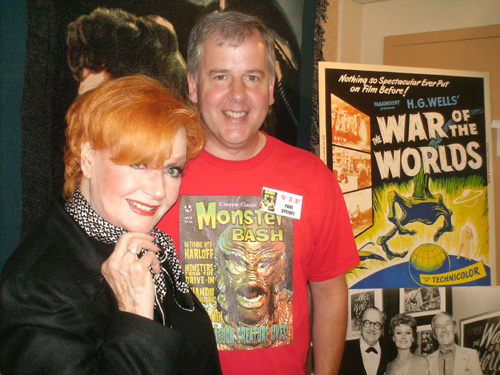 What a minute - that's WAR OF THE WORLD's actress Ann Robinson! 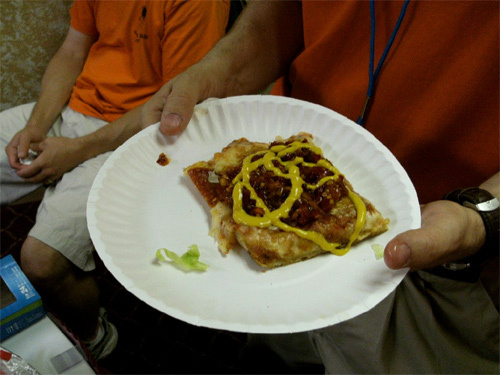 A behind-the-scenes look at the Monster Bash staff room....who would eat a slice of pizza with a load of hot pepper relish and mustard on it? Yikes! (BTW, it was delicious). It's a "Kevin" sandwich! 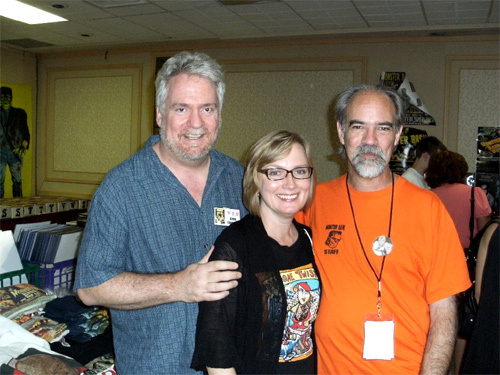 Kevin Corcoran (director of THE INSTITUTE OF SEANCE), actress Susie Corcoran, and Kevin Slick. 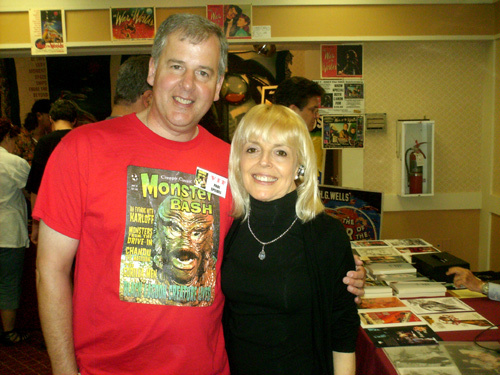 Paul Speidel and actress Susan Gordon. 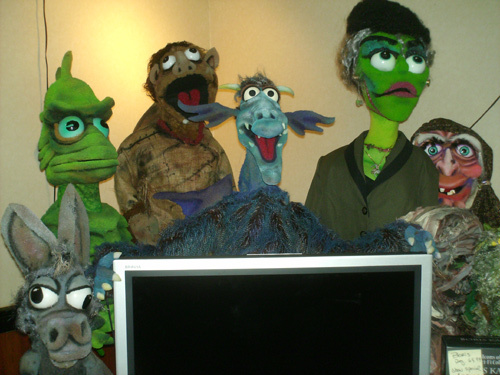 Bill Diamond's puppets used on MONSTER TV at Bash. 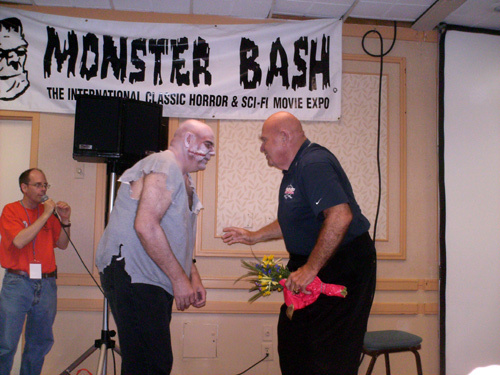 Tor Johnson (Don Reese) and George "The Animal" Steele ham it up as Tor brought flowers to The Animal. Ann Robinson and Paul Speidel at Bash. Kenny Miller and Paul Speidel. An old flame drops in on Julie Adams with flowers! Bob Pellegrino (Bash Q&A man) in the middle. 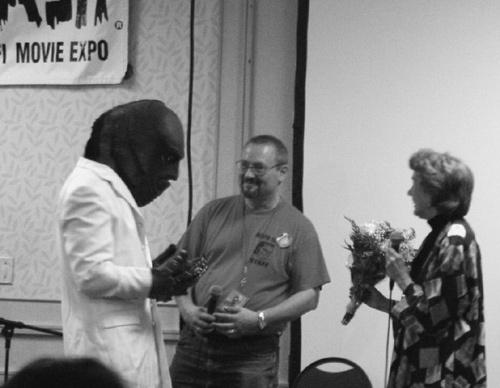 Mark (Goulardi) Hale meets the lovely Julie Adams (Creature From The Black Lagoon). 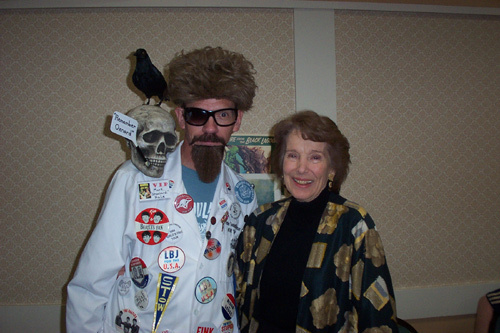 Ann Robinson (War of The Worlds) - Pictured with Mark (Goulardi) Hale! 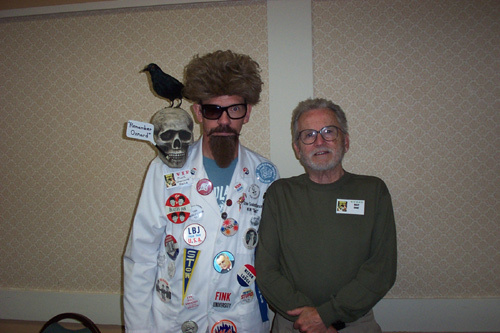 "Klatu"-"Barada"-"Nikto".....Mark (Goulardi) Hale and Billy Gray (Bobby) from (The Day The Earth Stood Still). 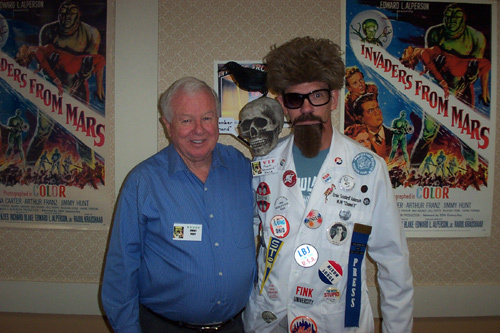 Jimmy Hunt (Invaders From Mars) - Pictured with Mark (Goulardi) Hale. 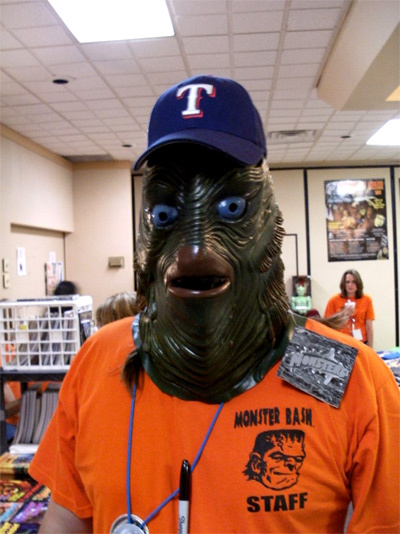 More Photos from Monster Bash 2010 - CLICK HERE!